The Yuma Proving Ground is the lineal Army descendant of these original military posts in the Yuma area. Wikimedia Commons has media related to Fort Yuma. 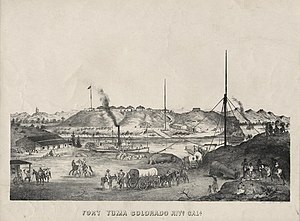 ^ "POST RETURN of Fort Yuma, California for July 1854". George H. Thomas Chronology. ~dmercado. 1998-01-01. Retrieved 2009-05-16. ^ a b "Fort Yuma". Office of Historic Preservation, California State Parks. Retrieved 2012-10-07. ^ Hart, Herbert. "Historic California Posts: Fort Yuma". The California State Military Museum. California State Military Department. Retrieved 18 August 2009. ^ "Regiments of the California Volunteers in Federal Service, 1st Regiment of Infantry". The California State Military Museum. California State Military Department. Retrieved 30 July 2009. ^ "The California Column". The California Military Museum. California State Military Department. Retrieved 30 July 2009.